My goal: To present accurate, unbiased information so that users can make better-informed decisions about gear, weapons and equipment before they buy. Having lots of good, clear photos helps. This site started was established on 04.10.01, and started out as a mixture of picture galleries of gear, weapons, uniforms etc. As more people started visiting the site looking for more information and asking me about the items pictured, I added brief descriptions under the photos. I then started writing short reviews of the equipment I had used, which grew into full-length product reviews. Where did the term 'military moron' come from? Well, my cousin Fi referred to her ex-husband Allan and I as 'military morons' when I visited England in 2000 as we kept talking about military stuff (he had been in the British military; RAF Regiment 3 Sqn). Since that visit, her husband and I referred to each other as MMs. I thought it was a funny term, so it stuck. No disrespect is meant to the Military - quite the contrary. This site is dedicated to my friends and family, and of course to the men and women who serve in the military and law enforcement who like to share info on the latest and greatest gear for their work, and who put their lives on the line for the rest of us. Some people have emailed me asking about the significance of the British flag on the front page of the site. It's there simply because I was born in England (which I'll always hold near and dear), and have made the United States my home. I also coined the word 'geardo' in June of 2002 on an Assaultweb.net thread to describe someone who had an inkling for Cordura and webbing, as I didn't like the term 'gear queer'. The term stuck somewhat and is currently in use by...geardos. It's been expanded to include any person who has an avid interest in gear or kit; specifically the equipment related to an activity, be it military or civilian. Similar to a 'gadget junkie'. I am not in law enforcement, nor have I served in the military, nor an 'expert' on anything (except, hopefully, my job) - I'm just an average working civilian with an affinity since childhood for the outdoors and shooting. So, I channel that interest into this website, and also work with manufacturers on equipment design and product photography in the industry as part of my hobby. I do learn from and pass along some of the knowledge and experience of the good friends who HAVE been there/done that, whose opinions I trust, but I'll be sure to state that they're not MY personal experience if I mention them. The opinions expressed on this site are mine, and unless otherwise mentioned, are based on my limited civilian/personal experience with the items I review, so bear that in mind when reading the writeups. That experience is limited to civilian activities over the years like backpacking, camping, hiking, shooting, running etc. And even so, my own experiences in those areas are limited with nothing really out of the ordinary worth mentioning. I do try to use all the items that I review as much as possible. Some questions I can answer, about fit, form and function (like, this pouch fits two M4 mags). But some others, like long term durability or functionality in the field, are difficult to determine without extended field use under conditions by someone who does it for a living (not me). Wherever possible, I obtain specifications and information directly from manufacturers, and I strive for accuracy in presenting that information. I do not know anything about tactics, and don't make recommendations about use of items outside my limited lane. If you don't like my reviews or don't think I'm qualified to write about the items, just ignore the text and look at the pretty pictures. I've also come across comments like 'How come we don't read negative reviews on mm.com?' or 'he's biased as he only writes positive reviews and doesn't mention the negatives'. There's a very simple explanation: the reason why you seldom read negative reviews on my site is because I don't review items that I know I won't like. I turn away a lot of stuff I'm not interested in. This is a personal site, not a consumer-reports/comprehensive site. I have a full-time job, young child and family to provide for, so my time is scarce. I don't want to waste it writing negative reviews on products I don't like. A far as mentioning the negatives, if you read my reviews carefully you'll see that I do mention them when I come across them. However, not everyone has the same experience, and it sometimes takes a while for flaws to surface, and only under certain conditions or applications. I can only write from my own experience, no one else's. It's just an average Joe's personal opinion, and since everyone's different, yours might very well be different. So use your own judgement when figuring out if something fits your needs - don't rely on my opinion alone. Items featured on this site are mostly supplied by the manufacturer in return for my time and effort. Some are personal purchases. There is no such thing as a 'free' item. It's 'free' if I don't have to work for it. Often, the time I spend on reviews exceeds the monetary value of the item. Items supplied or purchased get the same review - my obligation is to the consumer first. I do try to help manufacturers improve their products, and if there's any issue with the product, I'll take it up with them and give them a chance to correct it before I post my writeup. If anyone thinks that I cannot be unbiased if an item is supplied to me by the manufacturer, I'd be happy to take a donation from that person to purchase the product they want reviewed, thereby eliminating any perceived bias. Oh, and for those of you who've asked why all the faces are blanked out, it's to spare the visitor from looking at my ugly mug. Enjoy, and thanks for visiting. Update 3/26/16 - Some of you have noticed (and asked me about it) that I'm not posting as many writeups as I used to in the past, so I thought I'd post a quick update. Frankly, I'm surprised that I'm still writing. When our son was born in 2007, I really thought that I'd have to give this site up. Write ups take an insane amount of time. To write more than a couple of week is literally a part time job in addition to my full time job. Most of the time I had outside of work was devoted to photography, using the gear and writing about it. Amazingly (to me), I was able to still make time for write ups; mostly staying up my son's bedtime and spending more of the weekends to continue writing. The year after he was born, I posted 87 write ups! Nuts! As my little boy grows older, I'm spending more and more time with him as a good father should. Helping him with schoolwork, taking him to his Jiujitsu classes, going for walks, riding our bicycles, going to the beach etc. At the time of this writing, he's almost 9 years old. I've also added other activities besides my regular gym workout regimen like indoor rock climbing (my wife's passion) and I've started swimming again regularly after 30 years of laying off, so my time outside of work is spread out even more than before. 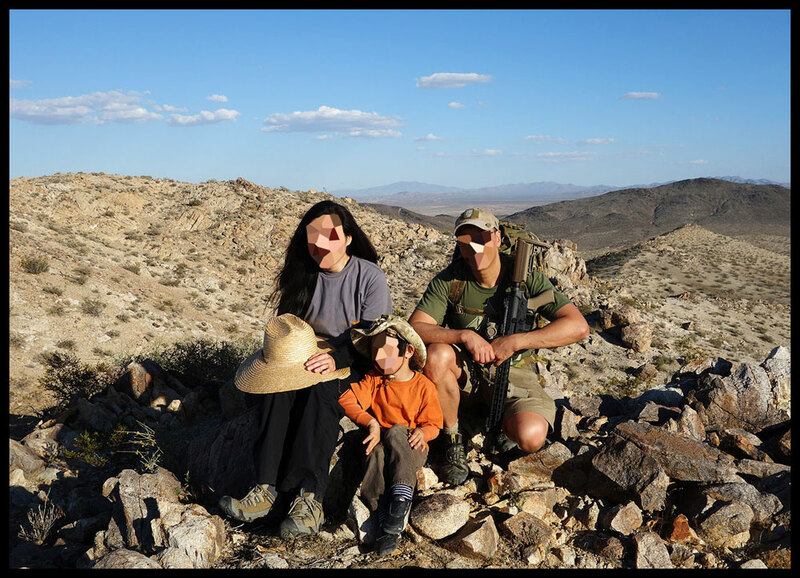 MilitaryMorons has always been a family effort - it would not have been created, or be possible without the continued support of my wife, who understands my passion for shooting and the outdoors. I'm not ceasing to do write ups; they'll just be less frequent than before. I still love this industry and all the folk I've met through my site. Thanks for reading!